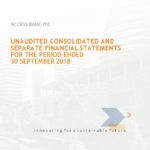 Access Bank Plc is a leading financial institution offering banking products and services for the retail, private, corporate and institutional and non-institutional sectors in Africa and Europe. The company offers solutions for corporate and investment banking, commercial banking, personal banking and business banking. In addition to transactional banking, Access Bank Plc offers cash management and treasury services, project and structured finance, supply chain and trade finance as well as insurance, brokerage services, liquidity management and debt management programmes. The company was established in 1989 and has grown its national and international footprint to approximately 300 branches. Access Bank Plc’s head office is in Lagos, Nigeria. This special general meeting (SGM) is often an assembly called on short notice of the company’s shareholders for urgent pertinent issues particularly those concerning the company’s management. To receive the company’s financial reports, sign up to the investor mailing list or click on the company profile above. Access Bank Plc is a leading financial institution offering banking products and services for the retail, private, corporate and institutional and non-institutional sectors in Africa and Europe. The company offers… READ MORE.